When mind and steel are joined to a common purpose, the psychic warrior is th eresult. 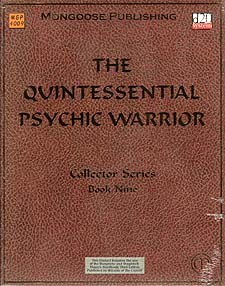 Combining mental techniques with combat skills, the psychic warrior is a competent fighter with a plethora of dazzling abilities hidden up his sleeve. Want to run up a wall and strike at an opponent from overhead? How about suddenly gaining an extra action while in combat? Or merge a weapon with your body so it is never out of reach? All of these, and more, lie within the grasp of the psychic warrior. The Quintessential Psychic Warrior greatly expands this class, adding new and exciting abilities while also opening up avenues for character development and opportunities for role-playing.